Adeola came to Tech for lots of reasons. One was to get his degree in agricultural business — he’ll graduate in February with that and a minor in business administration. He came to play football, even without a scholarship, and has been part of a program that’s won five straight bowl games in five years; Adeola has played a role in the most recent four. 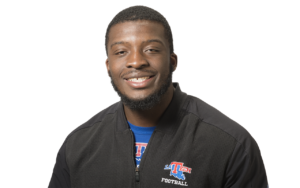 In Tech’s 31-14 win over Hawaii in the Hawaii Bowl in December, Adeola had the final sack of the game. And he came to develop relationships, which he’s done in spades. When Adeola begins thanking people who’ve helped him make what at times seemed impossible possible, the list is exhaustive. He thanks his parents, Francis and Grace, “who taught me to always work hard, respect everyone, and to stay humble,” he said. His professional dream of being a land banker or opening his own agriculture-based business began as a boy because of his love for the outdoors and his father’s hobby. “We were always in the backyard planting something,” he said, “either peppers or potatoes or something. I was always out there helping my father in the garden. His plan is to pursue his graduate degree in business administration at Tech. He still has a year of football eligibility remaining, yet it would be no surprise if he instead decides to concentrate fully on his studies. But it would be no surprise if he decides to play football for one more fall, either.